A lovely walk along Coledale and to the summit of Outerside and Stile End. A view over the rooftops of Braithwaite. And a view up to Barrow, Causey Pike, Stile End and Outerside. Heading deeper into Coledale. Thats Outerside up to the left. A vew back to the Vale of Keswick. 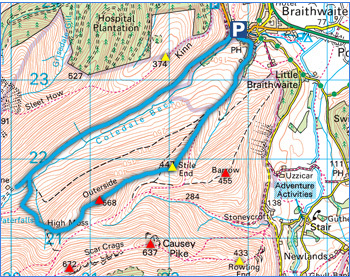 The going was easy along this section thanks to the trackway. Low Force tumbling down the crag behind Force Crag Mine. Low Force and Force Crag Mine. Continuing the steep ascent up to Outerside gives you better views of Grisedale Pike and Force Crag Mine. The summit of Outerside with Skiddaw behind in the clouds. The summit with Sail and Crag Hill. Grisedale Pike behind the cairnless top. The excellent view on the way down from Outerside. A profile shot of Causey Pike. The cairnless summit of Stile End. A view over the summit to Barrow. A view back to Outerside from Stile End. Grisedale Pike and the long path we were on earlier. Looking back up Stile End. Nearing Braithwaite again and there is a lovely view of Skiddaw ahead. Clough Head and Great Dodd from the edge of Braithwaite.